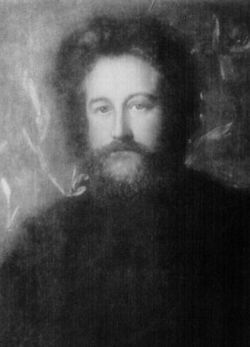 William Morris, socialist and innovator in the Arts and Crafts movement. 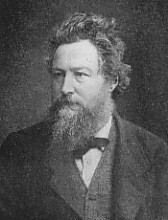 William Morris (March 24, 1834 – October 3, 1896) was an English artist, writer, socialist and activist. He was one of the principal founders of the British Arts and Crafts movement, best known as a designer of wallpaper and patterned fabrics, a writer of poetry and fiction and a pioneer of the socialist movement in Great Britain. His most famous work was the socialist, utopian novel, News from Nowhere, which expresses Morris' idealistic view that socialism would solve the problem of the drudgery and alienation of labor by making it an expression of human creativity. However, the attempts to implement state socialism have proved to stifle human creativity. His family was wealthy, and he went to school at Marlborough College, but left in 1851 after a student rebellion there. He then went to Oxford University (Exeter College) and received his degree in 1856. That same year he initiated The Oxford and Cambridge Magazine with his own funds. Many of his later collection of poems, The Defence of Guenevere, were first published in this journal. He became influenced by John Ruskin there, and met his life-long friends and collaborators, Dante Gabriel Rossetti, Edward Burne-Jones, Ford Madox Brown and Philip Webb there as well. He also met his wife, Jane Burden, a working-class woman whose pale skin, languid figure, and wavy, abundant dark hair were considered by Morris and his friends the epitome of beauty. These friends formed an artistic movement, the Pre-Raphaelite Brotherhood. They eschewed the tawdry industrial manufacture of decorative arts and architecture, favoring a return to hand-craftsmanship, raising artisans to the status of artists. He espoused the philosophy that art should be affordable, hand-made, and that there should be no hierarchy of artistic mediums. Morris left Oxford to join an architecture firm, but soon found himself drawn more and more to the decorative arts. He and Webb built Red House at Bexleyheath in Kent, Morris' wedding gift to Jane. It was here his design ideas began to take physical shape. (In honor of Morris's connection with Bexleyheath, a bust of Morris was added to an original niche in the brick clocktower in the town center in 1996.) He also built Standen House in Sussex along with Webb. In 1861, he founded the firm of Morris, Marshall, Faulkner & Co. with Gabriel Rossetti, Burne-Jones, Madox Brown and Philip Webb. Throughout his life, he continued to work in his own firm, although the firm changed names. Its most famous incarnation was as Morris and Company. 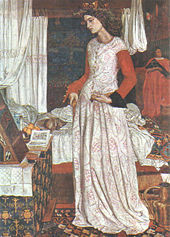 The company encouraged the revival of traditional crafts such as stained glass painting; Morris himself single-handedly recreated the art of tapestry weaving in England. His designs are still sold today under licenses given to Sanderson and Sons and Liberty of London. Morris had already begun publishing poetry and short stories through the magazine founded with his friends while at university. His first independently published work, The Defence of Guenevere was coolly received by the critics, and he was discouraged from publishing more for a number of years. He had also made a painting of King Arthur's Queen Consort. However, "The Haystack in the Floods," probably his best-known poem, dates from just after this time. It is a grimly realistic piece set during the Hundred Years War in which the doomed lovers Jehane and Robert have a last parting in a convincingly portrayed rain-swept countryside. When he returned to poetry it was with The Earthly Paradise, a huge collection of poems loosely bound together with the theme of a group of medieval wanderers who set out to search for a land of everlasting life and after much disillusion discover a surviving colony of Greeks with whom they exchange stories. The collection brought him almost immediate fame and popularity. The last-written stories in the collection are retellings of Icelandic sagas, and from then until his Socialist period Morris's fascination with the ancient Germanic and Norse peoples dominated his writing. Together with his Icelandic friend Eirikr Magnusson he was the first to translate many of the Icelandic sagas into English, and his own epic retelling of the story of Sigurd the Volsung was his favorite among his poems. Due to his wide poetic acclaim, Morris was offered the Poet Laureateship, after the death of Tennyson in 1892, but declined. Although Morris never became a practicing architect, his interest in architecture continued throughout his life. In 1877, he founded the Society for the Protection of Ancient Buildings. His preservation work resulted indirectly in the founding of the National Trust for Places of Historic Interest or Natural Beauty. Combined with the inspiration of John Ruskin—in particular his work in The Stones of Venice on The Nature of Gothic—architecture played an important symbolic part in Morris's approach to socialism. In the last nine years of his life, Morris wrote a series of fantasy novels later to be a strong influence on J. R. R. Tolkien and C. S. Lewis. In many respects, Morris was an important milestone in the history of fantasy, because, while other writers wrote of foreign lands, or of dream worlds, Morris' works were the first to be set in an entirely invented world—a fantasy world. These were attempts to revive the genre of medieval romance, and not wholly successful, partly because he eschewed many literary techniques from later eras. In particular, the plots of the novels are heavily driven by coincidence; while many things just happened in the romances, the novels are still weakened by the dependence on it. Nevertheless, large subgenres of the field of fantasy have sprung from the romance genre, but indirectly, through their writers' imitation of William Morris. Morris and his daughter May were among Britain's first socialists, working directly with Eleanor Marx and Engels to begin the socialist movement. In 1883, he joined the Social Democratic Federation, and in 1884 he organized the breakaway Socialist League. Morris found himself rather awkwardly positioned as a mediator between the Marxist and anarchist sides of the socialist movement, and bickering between the two sides eventually tore the Socialist League apart. This side of Morris's work is well-discussed in the biography (subtitled 'Romantic to Revolutionary') by E. P. Thompson. It was during this period that Morris wrote his best-known prose works; in particular A Dream of John Ball and the utopian News from Nowhere. Morris and Rossetti rented a country house, Kelmscott Manor at Kelmscott, Oxfordshire, as a summer retreat, but it soon became a retreat for Rossetti and Jane Morris to have a long-lasting affair. After his departure from the Socialist League Morris divided his time between the Company, later relocated to, the Kelmscott Press, and Kelmscott Manor. At his death in 1896 he was interred in the Kelmscott village churchyard. The Nature of Gothic by John Ruskin, printed by Kelmscott Press. First page of text, with typical ornamented border. News from Nowhere (1890) was an answer to the critics of socialism as well as a response to Edward Bellamy's Looking Backward, a book that epitomizes a view of socialism that Morris abhorred. It is a classic work of utopian fiction. In the book, the narrator falls asleep after returning from a meeting of the Socialist League and awakes to find himself in a future society based on common ownership and democratic control of the means of production. The remainder of the book explores a number of aspects of this society, including its organization and the relationships which it engenders between people. The book offers Morris' answers to a number of frequent objections to socialism, and underlines his belief that socialism will entail not only the abolishment of private property but also of the divisions between art, life, and work. In the novel, Morris tackles one of the most common criticisms of socialism; the supposed lack of incentive to work in a communist society. Morris' response is that all work should be creative and pleasurable. This differs from the majority of Socialist thinkers, who tend to assume that while work is a necessary evil, a well-planned equal society can reduce the amount of work needed to be done by each worker. News From Nowhere was first published in serial form in the Commonweal journal beginning on January 11, 1890. In January 1891, Morris founded the Kelmscott Press at Hammersmith, London, in order to produce examples of improved printing and book design. The books were designed to make reference to the methods and techniques he used, what he saw as traditional methods of printing and craftsmanship, in line with the Arts and Crafts movement as a whole, and in response to the prevalence of lithography, particularly those lithographic prints designed to look like woodcut prints. 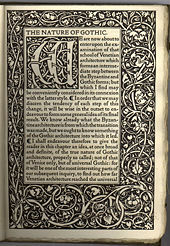 He designed clear typefaces, such as his Roman 'golden' type, which was inspired by that of the early Venetian printer Nicolaus Jenson, and medievalizing decorative borders for books that drew their inspiration from the incunabula of the fifteenth century and their woodcut illustrations. Selection of paper and ink, and concerns for the overall integration of type and decorations on the page made the Kelmscott Press the most famous of the private presses of the Arts and Crafts movement. It operated until 1898, producing 53 volumes, and inspired other private presses, notably the Doves Press. Among book lovers, the Kelmscott Press edition of The Works of Geoffrey Chaucer, illustrated by Burne-Jones, is considered one of the most beautiful books ever produced. A fine edition facsimile of the Kelmscott Chaucer was published in 2002 by The Folio Society. The Morris Societies in Britain, the US, and Canada are active in preserving Morris's work and ideas. The influence of William Morris lives on in modern interiors and architecture. Companies such as Harvest House and Stickley Furniture continue to sell Arts and Crafts-style pieces. Edward Burne-Jones-designed and Morris & Co.-executed Nativity windows (1882), Trinity Church, Boston. Edward Burne-Jones-designed and Morris & Co.-executed The Worship of the Shepherds window (1882), Trinity Church, Boston. Detail from Edward Burne-Jones-designed and Morris & Co.-executed The Worship of the Shepherds window (1882), Trinity Church, Boston. Morris also translated large numbers of medieval and classical works, including collections of Icelandic sagas such as Three Northern Love Stories (1875), Virgil's Aeneid (1875), and Homer's Odyssey (1887). Morris's book, The Wood Beyond the World, is considered to have heavily influenced C. S. Lewis' Narnia series, while J. R. R. Tolkien was inspired by Morris's reconstructions of early Germanic life in The House of the Wolfings and The Roots of the Mountains. Editor and fantasy scholar Lin Carter credits Morris with originating the imaginary-world fantasy with The Well at the World's End and his subsequent fantasy novels. These contain no reference to this world; they are set neither in the past nor in the future (as is News from Nowhere), and not on another planet. ↑ Lin Carter (ed. ), Kingdoms of Sorcery, (Doubleday and Company Garden City, NY, 1976), 39. ↑ William Morris Society: Merton Abbey Retrieved April 16, 2008. Carter, Lin (ed.). Kingdoms of Sorcery. Doubleday and Company Garden City, NY, 1976. All links retrieved November 22, 2014. This page was last modified on 23 November 2014, at 00:01.